Luigi is one of the first Nintendo Nendoroids released by Good Smile Company and was released to celebrate the Year of Luigi. One of the strengths of Nendoroids is how well they capture a character’s personality in a cute and charming way. Fortunately, the Luigi Nendoroid is no different. In this review, I cover some of the basics of Nendoroids just in case the reader is not familiar with them. As I write more reviews, I will skim over the basics. With that said, let’s take a closer look at this Nendoroid. Packaging – Unlike Amiibos or Micro Land which can be kept in the box, but are designed to be opened and enjoyed, Nendoroids are often stored in their box and the box is designed so that it is easy to preserve. As a result, many reviewers focus on the artistry of the box. While I can understand why reviewers do this, I think I will just simply say, the box has a clean and simple design. 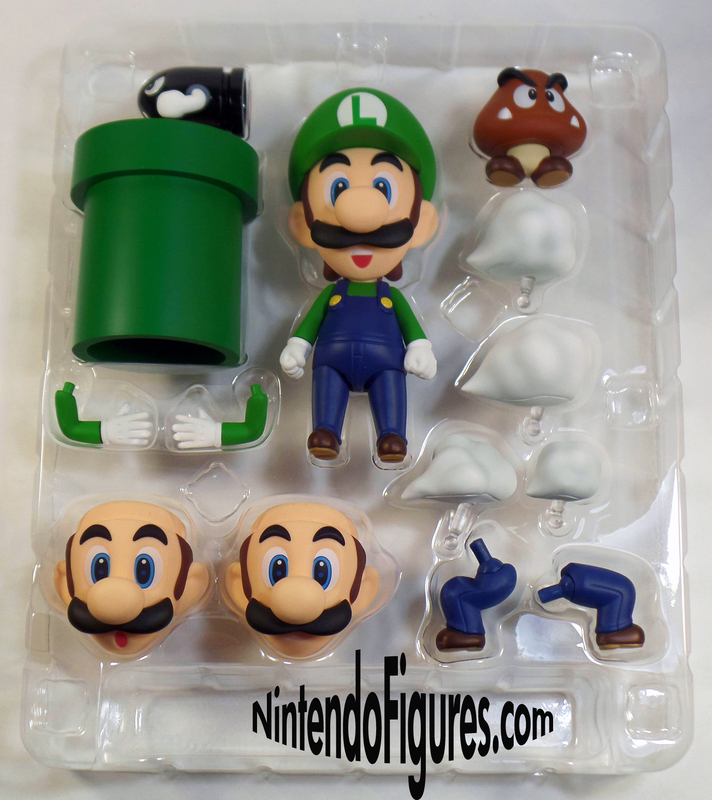 It is nice to see different Mario and Nintendo logos on the box as well as different poses you can put Luigi in. The box also has a nice window so you can always see Luigi and the main accessories. All Nendoroids come in a two piece plastic holder with all of the accessories which is easy to open, reseal, and store back in the box if you’d like. Nendoroid collectors may take this for granted, but it is great to have such easy storage of the figures. Figure – First off, the quality of Nendoroids paint and finish is excellent. It is higher quality than anything in World of Nintendo and better than Amiibos as well. Luigi is a simple character, but there are zero paint issues on mine and he has all of the right details like seams in his clothes. He also comes with three different face plates which can easily be changed by pulling off his hat and then the face plate. Luigi has a surprised face, smiling face, and a really happy face. All three play up his cuteness, especially the surprised face and can help you capture a range of emotions in your display. 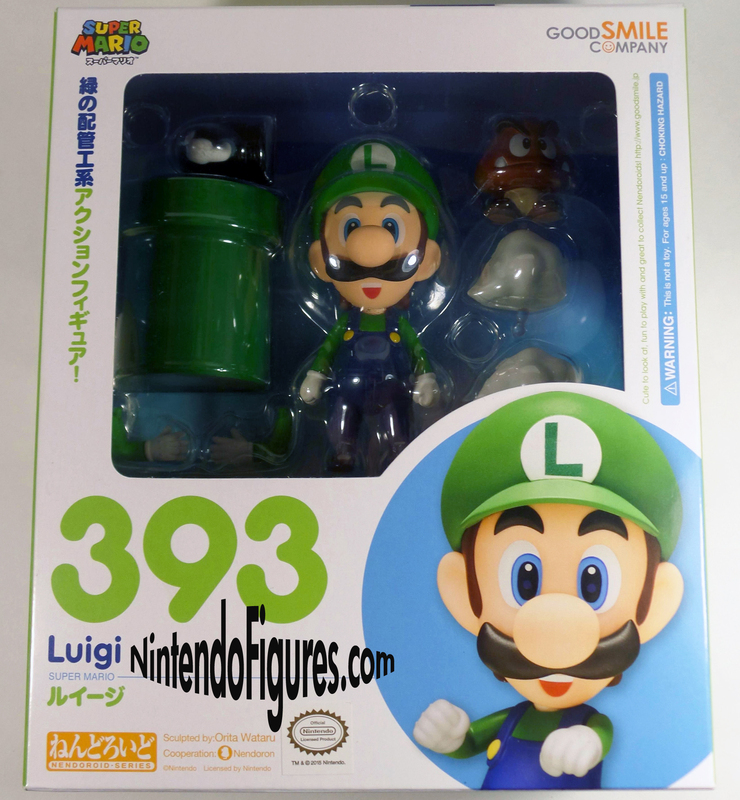 If you want a high quality figure of Luigi, then the Nendoroid will deliver. To display your Nendoroid, you generally have to use the base and stands for any figure and that is true with Luigi. The stands not only help with his balance, but also are what let you put him in the air to look like he is jumping. The base is larger than what you get with most other Nendoroids, but this is important since Luigi has large accessories that need to be on the base with him. In What Are Nendoroids and Why Collect Them?, I discussed how Nendoroids are not an action figure or a statue in the way you might expect. They have relatively limited articulation and that is true of Luigi. His arms can be moved quite a bit, but his legs are either straight up and down or bent with almost no articulation. Luigi’s head can go backwards and forward a bit and left to right though again, it is less than a lot of action figures. That is something I don’t mind because the focus is on posing and displaying Luigi and that is where he shines. Luigi can easily be shown as running, jumping, or coming out of the warp pipe. I will talk about this more when I review the Mario Nendoroid, but that figures expands what you can do with Luigi further as well. Ultimately, the figure quality is great and you can represent all of the main things Luigi does in a Mario game with the Nendoroid. Accessories – This is really where Luigi and Nendoroids shine. One of the most unique accessories is the cardboard backdrop that he comes with. The hills of the Mushroom Kingdom really enhance the displays you can make with Luigi and it is relatively rare for Good Smile to include a feature like this with Nendoroids which makes a treat for Nintendo fans. 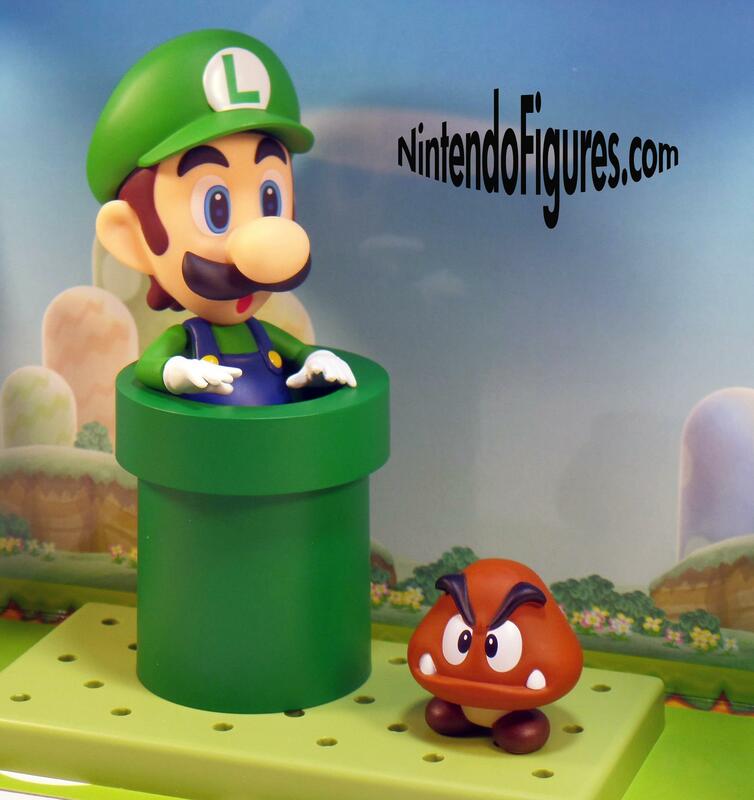 He comes with a Goomba figure and Bullet Bill figure. Both figures have high quality paint, particularly Bullet Bill with his shiny black paint. The warp pipe also is well-painted, has nice quality plastic, and Luigi fits into it perfectly. 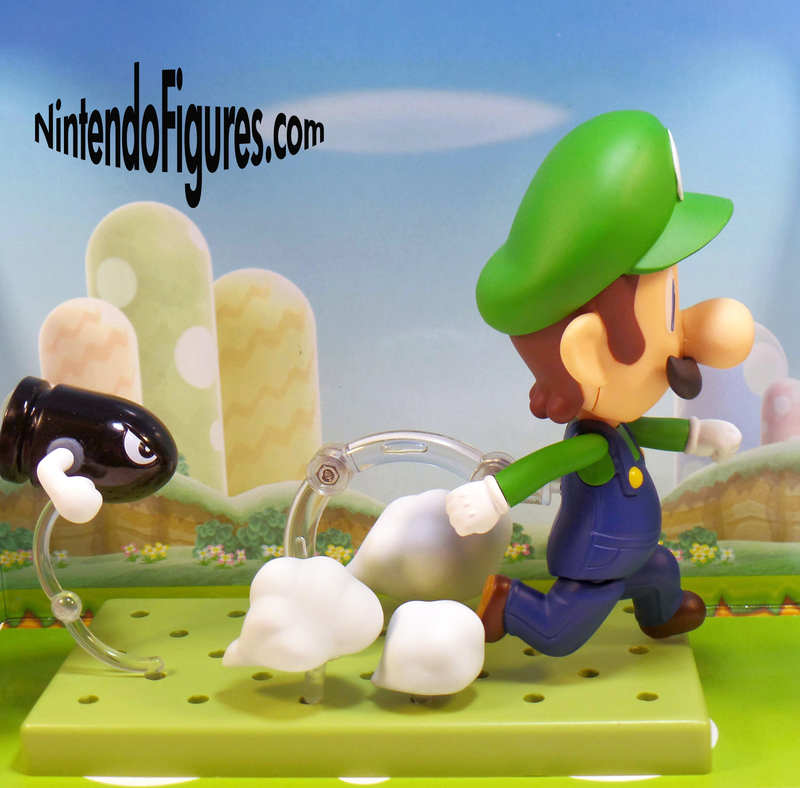 While these are the big accessories, Luigi also comes with five “puff” clouds that you often see when he runs. These could be used for just about any Nendoroid, but they really represent Luigi well because of how fast he runs and how slippery he can be to control. Overall, Luigi has good accessories, they give you more display options than a typical Nendoroid which is certainly appreciated. Poses – As mentioned before, Luigi has a ton of different display possibilities. You can have him running to and from an enemy, emerging (or hiding in the warp pipe), jumping onto an enemy or even just hanging out on his base with a nice Mushroom Kingdom style background. I have taken a few pictures to give you ideas, but Nendoroids really do invite you to be creative and there are way more possibilities than I can share in this review. Of course, your options grow the more Nendoroids you have too. Closing Thoughts – If you expect a lot of articulation or don’t like the cuteness of Nendoroids, then this figure probably isn’t for you. However, Nendoroids are really high quality and have more display options than nearly any figure out there. The catch is that they are focused on display and not being played with like a traditional action figure which for many collectors is not necessarily a bad thing. 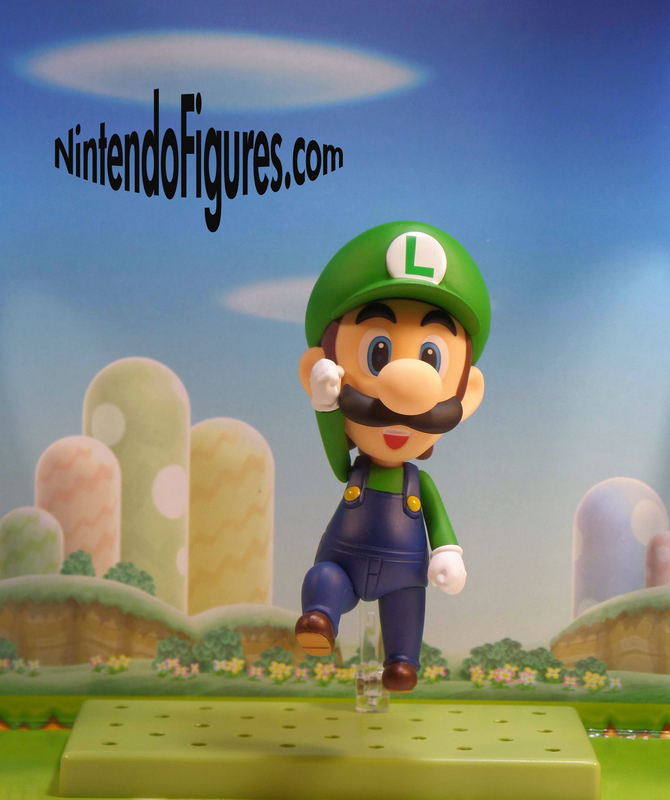 Luigi is a great figure to start with because he has a lot of possibilities straight out of the box and you can add Mario for even more display possibilities. I really enjoy my Luigi Nendoroid and plan on getting several more in the future.